To improve the overall health of the body, herbs and spices have been playing a major role for decades. They help in the faster healing of wounds, act as nutritional supplements, and also deliver a host of benefits. Herbs strengthen the immune system, lower blood sugar and cholesterol levels, have anti-inflammatory properties, and prevent Alzheimer’s diseases as well as various types of cancer. Herbs eliminate nutritional deficiencies and thus restore the correct functioning of the body. They rectify various problems rather than suppressing them. It is also said that herbs nourish every part of the body with their vitamin and mineral content. In short, our body needs certain essential dietary nutrients to meet the everyday demands of life and herbs provide us with most of the necessary components for a healthy life. Herbs are normally used as flavoring additives to culinary dishes. Along with that, they are now an integral part of various medicinal practices in most countries. Many herbal extracts like those derived from mint, licorice, fenugreek, ginkgo, and aloe vera are used in medicines. The health benefits of herbs vary with their type. For example, artichoke cures different kinds of digestive problems, whereas ‘American ginseng’ works as a health tonic and ‘rosemary’ promotes healthy brain function. Almost all herbs have some health benefits and you can consume them after the recommendation of a medical practitioner. Plants that are prized for their scent, flavor, medicinal benefits, or other assets are known as ‘herbs’. Herbs are usually used in foods, for making medicines, for pest control, and also for spiritual purposes. Since ancient times, the culinary and medicinal values of different herbs have been appreciated by almost every part of the world and among different cultures. They can be classified into innumerable categories depending on their scientific family and genus. In this article, we will discuss two popular categories, namely Chinese herbs, and medicinal herbs. Chinese Herbs: In China, the innumerable health benefits of herbs have been praised for centuries in their well respected medicinal systems. In fact, they were considered to be the most powerful treatment method in ancient times and many people from different countries relied on Chinese herbs alone to cure many diseases. In those days, herbs were often associated with miracles and magic. Chinese herbal medicine dates back to over thousands of years to approximately the rule of the Han dynasty. According to this system, Chinese herbs can be categorized into its five main tastes. Spicy herbs treat cold and respiratory problems effectively and also improve blood circulation; while sweet herbs improve the functioning of the spleen. They can also relieve pain and boost immunity. Bitter herbs aid the cardiovascular system while treating constipation and asthma. Sour herbs treat liver disorders and help in the digestive process. Salty herbs promote the health of kidneys. Other than these common varieties, some bland herbs were also praised due to their effective healing properties. Medicinal Herbs: Medicinal herbs treated most of the health ailments when there was no use of intricate medicinal instruments and drugs. These herbs worked wonders with their juices, extracts, barks, leaves, flowers, and sometimes the entire plant. They have been popularly known as medicinal herbs and their applications were passed on through many generations. However, before using any herb for medicinal reasons, it is essential to know about the plant and the related research. For instance, comfrey was used as an anti-inflammatory agent for treating bruises, sprains, and other wounds, bladderwrack being a good source of iodine, was used in many medications for thyroid conditions, aloe vera was used for minor burns, kava-kava treated depression and anxiety, while milk thistle treated a host of liver diseases. As you can see, specific herbs function in different ways, and it is essential to understand this. You have probably heard the term ‘herbal combinations’. These are combinations of different medicinal herbs that work better together than they do by themselves. These specific combinations are made by considering different aspects and phases of health needs. They are powerful nutritional agents with the goodness of many herbs mixed together to ensure good health, as compared to a single herb being used for one treatment at a time. Some herbal combinations are made for specific ailments like hypertension, insomnia, blood pressure, and gastritis, while others promote general well being like energy production, skin care, healthy brain functioning, and weight control. For example, a combination of neem and turmeric can fend off many skin infections. Herbal combinations should not be made a habit and should be followed only until the prescribed time, or until the specific affliction is healed. 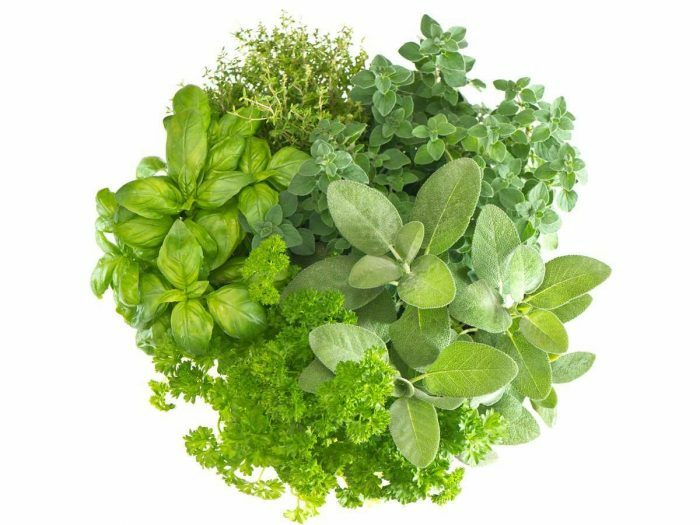 Herbs are rich in antioxidants, phytosterols, vitamins, and other nutrient substances that equip the body to fight against toxins and germs. They help in boosting the immune system as well. In fact, you can call herbs as ‘medicines’ when taken in small doses. These immune-boosting herbs are elderberry, garlic, ginger, onion, hibiscus, cinnamon, and goldenseal. The essential oils present in some herbs, like ginger root, have excellent anti-inflammatory properties. These herbs inhibit the enzyme cyclooxygenase (COX), which facilitates inflammatory reactions in your body. This is the reason why herbs are excellent natural remedies for conditions like inflammation, osteoarthritis, and rheumatoid arthritis, and inflammatory bowel ailments like ulcerative colitis. Some herbs have positive effects on the pancreas, thereby balancing blood sugar levels. They have reportedly controlled many cases of type I or type II diabetes. For instance, fenugreek, bilberry, and cayenne pepper extracts are said to be good blood sugar-stabilizing herbs. Herbs like psyllium, fenugreek, and licorice can result in a noteworthy reduction of cholesterol and blood pressure levels, thereby preventing various coronary ailments. Many herbs have antioxidant, anti-amyloid, and anti-inflammatory properties, which can effectively prevent Alzheimer’s disease. In Europe, the Ginkgo herb has been used widely to treat Alzheimer’s disease and other forms of dementia. Since ancient times, especially in Chinese medicine, herbs were extensively used for treating cancer symptoms. In fact, herbs also help soothe the aftereffects of chemotherapy. Researchers at Memorial Sloan Kettering Cancer Center have shown through a number of studies that gastric, hepatoma, colon, and breast cancer cells can be effectively destroyed by many medicinal herbs like oldenlandia, scutellaria, taraxacum, and phragmites. These herbs purify blood and prevent cell mutations that usually lead to cancerous growths. The volatile oils derived from certain herbs emit cytotoxicity action against pancreatic, prostate, endometrial, and colon cancer cells. However, the selection of herbs to cure cancer should be strictly done under the supervision of a medical practitioner. For ages, herbs have shown significant benefits when it comes to natural skin care. Amongst the innumerable herbs found all over the globe, some common herbs like neem, turmeric, aloe vera, and holy basil assure radiant and healthy skin. If you mix the powdered form of holy basil, neem, mint leaves and a pinch of turmeric powder, it will eventually fade any dark spots on your face. Chamomile oil, when applied topically, helps repair damaged skin tissues. Tea tree oil is a great herbal extract used in cosmetics like face washes and creams for oily skin, as it has the ability to control oil secretion from the pores. Aloe vera is extensively used in manufacturing skin products, as this herb gives a smooth and youthful touch to the skin. Basil leaves are also an important ingredient for skin care products, particularly in India. Like skin care, hair care has also become a prevalent practice through herbal applications. Massaging your hair with jojoba oil stimulates the bountiful growth of your hair. There are many more herbs like gotu kola, horsetail, ginseng, and marigold extract that similarly stimulate hair growth. If you use cooled chamomile tea as a hair toner, it will give you a natural blonde hair coloring effect. With the application of lemon juice, you can enhance the color effect as well. Aloe vera juice or oil regenerate hair cells, thereby repairing damages and also soothing the scalp with a cooling sensation. Fenugreek enhances blood circulation to the hair roots. Ivy burdock cleanses hair and also cures scalp problems like itchiness and dandruff. Herbal toothpaste is now widely available in the market, which often ensures a perfect set of teeth and gums for you without any side effects. Some tooth cleaners on the market contain harsh abrasives, whiteners, detergents, or bleach that can cause harm to your teeth over the long term. Thus, opting for herbal methods for natural dental care is a wise choice. There are numerous herbs that, when used directly on the teeth and gums, give wonderful results. For instance, rubbing sage leaves on the teeth and gums cleans them instantly and makes the texture smooth. If teeth stains are a problem for you, rub alpine strawberry over the teeth. Bad breath can also be easily eradicated by using lavender water, fresh parsley or mint tea as an herbal mouthwash. For toothaches, clove oil is probably the most effective and readily available medicine. For a healthy mouth and gums, herbs like alpine strawberry, lavender, thyme, sage, neem, fennel, parsley, aloe vera, and mint are found to be very effective and are widely used in the manufacturing of herbal toothpaste, mouthwashes, and teeth whiteners. Herbs have a number of benefits for your body – the healing properties of herbs vary, but usually most of them are carminative (cure gastric issues), diaphoretic (control water retention), lipolytic (help in weight loss), anti-spasmodic, analgesic (relieve pain), deodorant, aphrodisiac (increase sexual drive), antiseptic, digestive, and stimulant when taken in correct dosage. There are countless herbs grown all across the globe. 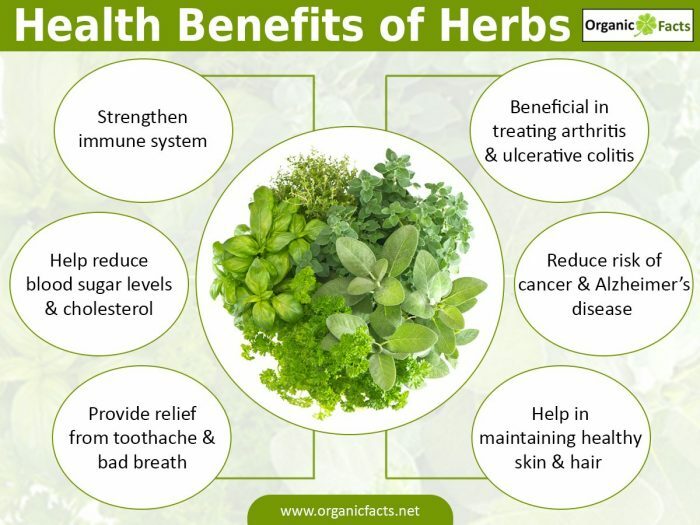 We have listed the most important herbs and their benefits below. Aloe vera is a stemless or very short-stemmed plant that grows 80-100 cm tall and spreads root sprouts. The leaves are thick, fleshy, and green with a ragged margin. Aloe vera is a popular medicinal herb that grows in arid climates and has healing components, which include mannans, anthraquinones, polysaccharides, and lectins. This herb efficiently heals wounds and burns. Moreover, drinking aloe vera juice is highly recommended for diabetes, minor skin infections, cysts, and elevated blood lipids. Aloe vera extract is an important skin care agent. This herb is an excellent source of niacin, dietary fiber, zinc, copper, and phosphorus, and it also has a host of vitamins like vitamin A, vitamin C, vitamin B6, riboflavin, folate, and minerals like iron, calcium, magnesium, potassium, and manganese. The herb helps in dealing effectively with issues like indigestion, diarrhea, insomnia, dysentery, hiccups, respiratory disorders, menstrual disorders, cancer, and a number of others. This herb contains ‘eugenol’, a volatile oil that has potent antiseptic and anesthetic powers. Dill also helps in the generation of breast milk and increases sperm count. Chives belong to the onion family and are the smallest ones in it. These are enriched with vitamin A, C, K and B vitamins like thiamin, riboflavin, niacin, and pantothenic acid, and minerals like phosphorus, magnesium, folate, potassium, calcium, iron, copper, manganese, and zinc, as well as dietary fiber. Chives help aid proper digestion and also stimulate the appetite. Moreover, it helps digest fatty foods, improves the respiratory system, and prevents obesity through fluid retention. They keep cancer from developing, especially prostate cancer. They also aid in alleviating fatigue issues, have mild anti-inflammatory properties, and kill germs in the intestines and colon. Holy basil leaves are probably one of the most ancient herbs used for medicinal purposes. These leaves are rich in protein, riboflavin, folate, niacin, calcium, magnesium, iron, potassium, phosphorus, copper, and zinc. Holy Basil also has high levels of vitamin E, A, C, K, and B6, and dietary fiber. They also aid in curing fevers (especially dengue and malaria) very quickly. Since ancient times, tulsi leaves have been added to tea, honey or warm water to cure colds, coughs, sore throats, and respiratory disorders. These leaves have anti-inflammatory properties and are also effective in case of kidney stones, cardiovascular diseases, insect bites, skin infections, and dental and eye problems. This herb has a special spiritual reverence in India. Rosemary is a very good source of dietary fiber, vitamin A, vitamin C, folate, calcium, iron, manganese, and a good source of vitamin B6, magnesium, potassium, and copper. Rosemary has numerous health benefits like stimulating the nervous system, improving memory, relieving muscle pain, aiding in digestion, and eliminating circulatory problems, rheumatism, spasms, neuralgia, pain, eczema, wounds, and depression. Rosemary also increases urine production. Another fact about rosemary is that it can be used in combination with St. John’s wort and ginkgo biloba to cure brain inflammation. It is effective in treating migraines and other variations of headaches as well. Rosemary oil is useful for proper digestion, and skin and hair care. This herb is a symbol of purity and cleanliness. Lavender also speeds healing, relieves muscle tension, and reduces stress, while improving the circulatory, immune, and nervous systems. Lavender oil is a great antiseptic, carminative (relieves flatulence), and spasmolytic (relieves muscle spasms). The medicinal properties of this herb include anti-inflammatory, anti-fungal, and antiseptic abilities. In modern times, many stores sell lavender scent for perfumes, diffusers, soaps, talc, and other cosmetics as well. Peppermint is rich in phosphorus, niacin, potassium, copper, magnesium, manganese, riboflavin, folate, calcium, iron, and zinc, and is a rich source of vitamin A, vitamin C, and dietary fiber. Peppermint is a good stomach calmer, especially if you are suffering from digestive problems, flatulence or any other related gastric problems. Mint restricts bacterial and fungal growth, as well as helps relieve allergies and asthma. Many researchers say that mint also shows positive effects for cancer treatment, but further research is required to prove this. Mint juice is said to cure irritable bowel syndrome, thereby preventing constipation and colon ailments. The market has an abundance of mint-flavored toothpaste, juice, chewing gum, squash, ice tea, ice creams, and even medicines like laxatives and digestive syrups. Fenugreek seeds are often used as spices and the leaves of the plant are used as herbs. They are rich in protein, copper, magnesium, manganese, iron, and dietary fiber. Apart from the seeds, the other parts of the fenugreek plant also have medicinal values. Intake of fenugreek balances cholesterol levels, treats diabetes and lowers blood sugar. Fenugreek seeds have lots of mucilage, which soothes gastrointestinal inflammation by protecting the stomach and intestinal linings. This herb cures inflammation and, is thereby, a home remedy for boils, abscesses, eczema, burns, and gout. Fenugreek is often recommended for pregnant women as it aids in childbirth and milk production while lactating. However, this herb also has some side effects relating to gastrointestinal discomfort, thus it is advisable to consult a doctor before starting any supplementary tablets. Moderate amounts of fenugreek herb or seeds in your diet will not have any such effects. Psyllium is also known as ispaghula (‘Isabgol’ in India). This is usually found in husk form from the seeds of the Plantago ovata herb. Rich in soluble dietary fiber content, psyllium is the major ingredient in many commonly used bulk laxatives. This herb usually helps cope with constipation problems and intestinal ulcers, cleans the colon, and helps control cholesterol, weight, and blood pressure. However, if you are having problems with diabetes or if you are pregnant, consult a doctor before consuming psyllium. Cayenne pepper is rich in niacin, riboflavin, magnesium, iron, potassium, manganese, vitamin C, A, E, K, and vitamin B6, and dietary fiber. Cayenne pepper is best known for its beneficial properties for the human circulatory system. This herb helps in keeping the blood warm and equalizes the blood pressure in the venous and arterial system – both of which are essential for a healthy circulatory system. This herb also helps in alleviating allergies and muscle cramps, while improving digestion and healing wounds effectively. This herb works effectively for weight reduction, therefore many dietitians recommend cayenne pepper for a healthy and trim body. Guggul is a flowering plant widely used as a medicinal herb. It helps in weight management, relieves arthritis and menstrual pain, improves circulation, lowers cholesterol, and alleviates skin problems. This herb also increases white blood cell count and protects against ailments like the common cold, skin, dental, and eye infections. Hawthorn berry is a very valuable herb for the heart and cardiovascular system. It can dilate the arteries and enhance the levels of blood and oxygen streaming to the heart. This herb also dilates blood vessels all over the body so that blood circulation does not exert as much pressure on the heart. It has antioxidant properties, thus preventing the possibilities of atherosclerosis and cancer. It regulates blood pressure, treats angina, and corrects arrhythmia (irregular heartbeat). However, excessive doses of hawthorn can have side effects, so it’s better to consult a doctor before starting this medication. This herb is derived from the oldest living tree species, known as Ginkgo biloba. Ginkgo has immense health benefits due to its rich content of vitamin C and niacin. It helps in improving memory and mental clarity, which is why this herb is a popular ingredient in most brain tonics. It is commonly used to treat Alzheimer’s disease in elderly patients. This herb has also shown positive effects in treating tinnitus, vertigo, and other circulatory disorders. Ginkgo is helpful in combating stress and poor nutrition that can lead to cardiovascular diseases, brain damage, hearing disorders, and other diseases. It reduces anxiety, tension, and fights allergic reactions in the body. Ginkgo biloba is a great natural medicine for cholesterol, diabetes, hemorrhoids, and asthma. The roots and stem of butcher’s broom are specifically used for herbal medicines. It improves circulation, relieves constipation, enhances blood flow to important parts of the body like the brain and limbs, and cures hemorrhoids. Butcher’s broom also soothes the pain of rheumatism and arthritis, swelling, cramps, and other symptoms related to chronic venous insufficiency. It is also used as a mild diuretic and laxative. Winter cherry is a well-known herb that is commonly used as a diuretic, aphrodisiac, sedative, revitalizing tonic, an anti-inflammatory agent, and an immune stimulator. It helps to reduce swelling and aids in retaining blood supply in the body. Furthermore, it aids in the proper functioning of the nervous system. It also improves concentration, sexual abilities, and asthmatic conditions. Like Tulsi, Bacopa is also another ancient herb used in medicines, especially in Asia. This medicinal herb is extensively used as a mental tonic, body revitalizer, memory enhancer, and nerve tonic. It is best known for its ability to enhance memory and to cope with the negative effects of stress. Bacopa is an excellent home remedy for a host of skin problems like psoriasis, eczema, abscess, and ulceration. It is also good for skin, hair and nail growth. Brahmi considerably reduces the oxidation of fats in the blood, thereby reducing the chances of cardiovascular diseases. There are many other herbs found all around the world, and each one of them has special health benefits. Herbs like Azadirachta indica (Neem), Boswellia Serrata (Shallaki), Shilajit, St John’s wort, Terminalia, Triphala, and wheatgrass are just a few more that are being discovered, studied, and added to the vast galleria of herbs that grow in different parts of the world. Use of some of the herbs is banned/restricted in some countries. Consult your local health specialist before using them.